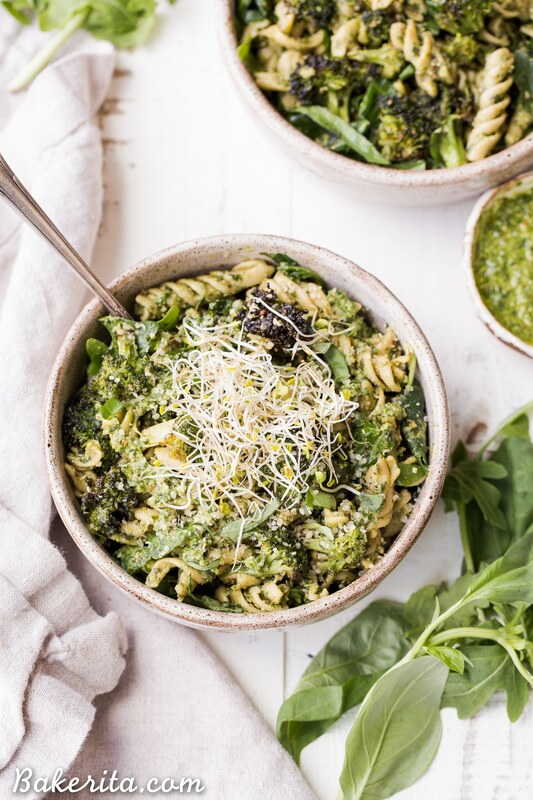 This Arugula Pesto Pasta Bowl with Broccoli is one of my favorite quick and easy go-to meals! It’s filling, nutritious, and simple to make in just 30 minutes. You’re going to want to put the homemade dairy-free arugula pesto on everything! If you follow me on Instagram and watch my stories, I’ll bet that this meal looks pretty familiar to you. For good reason – I eat it on the regular. It’s definitely one of my favorite meals because I can simply not get enough of broccoli or pesto. This time, I made my own pesto out of arugula and basil. However, I usually just use whatever pesto I have on hand, whether that’s homemade, from the farmer’s market, or the vegan kale cashew pesto from Trader Joe’s. This is a meal about CONVENIENCE. 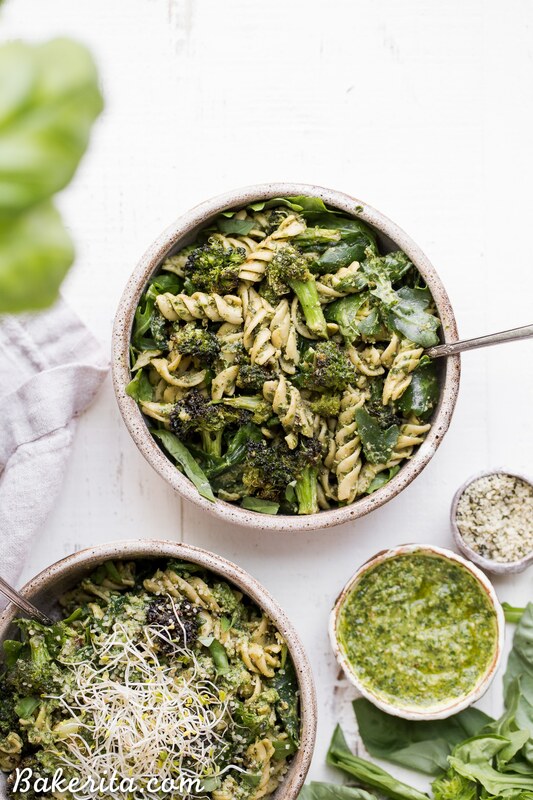 Even if you’re making the pesto from scratch though, you can do it while the pasta boils and the broccoli roasts so it’s still so quick and easy. The broccoli is roasted the way I always do and described above: a drizzle of avocado oil and some spices. This time I kept it simple with salt, pepper, and garlic powder. 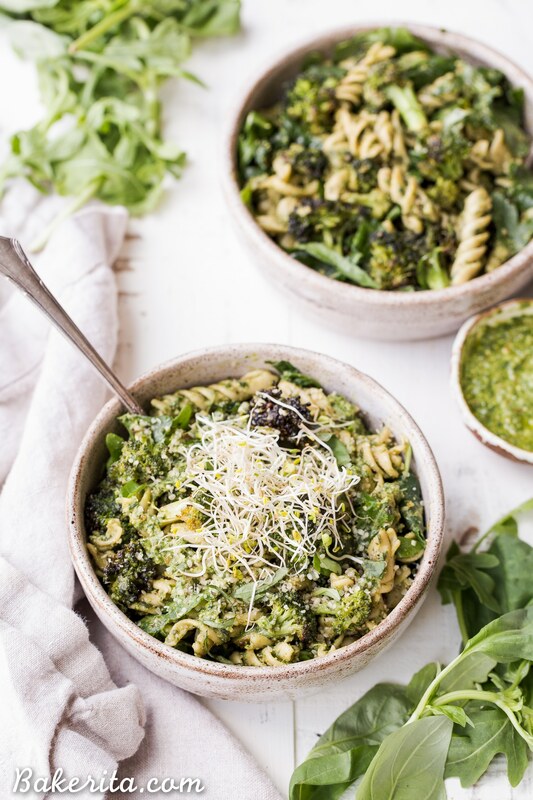 This Arugula Pesto Pasta Bowl with Broccoli is one of my favorite quick and easy go-to meals! It's filling, nutritious, and simple to make in just 30 minutes. 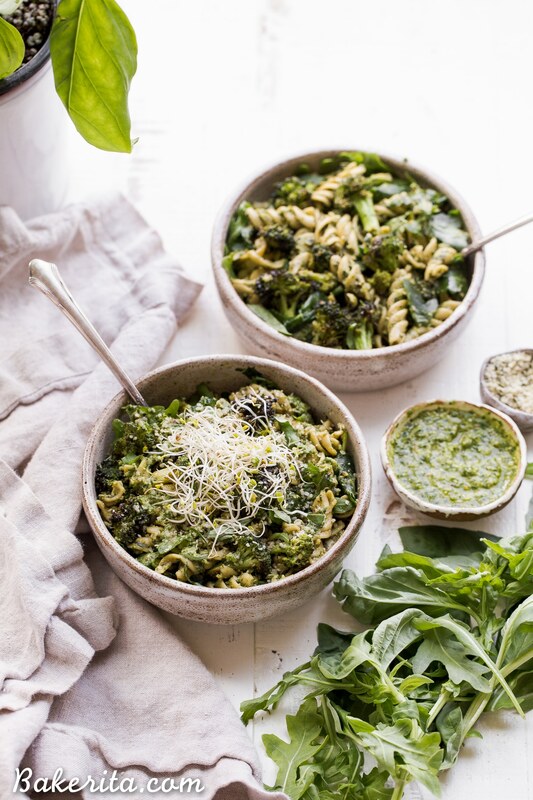 You're going to want to put the homemade dairy-free arugula pesto on everything! Preheat oven to 400ºF. Line a large baking sheet with parchment paper or foil (optional, for easy cleanup). Place the chopped broccoli on the baking sheet and drizzle with avocado oil. Sprinkle on your spices and use your hands to toss to combine, making sure all of the broccoli is lightly coated in spices and oil. Roast for about 20 minutes, or until lightly browned. Meanwhile, bring 6 cups of salted water to a boil in a large pot. Add the pasta and cook according to package directions. If you’re using Banza or another lentil/chickpea pasta, make sure to rinse in warm water when it’s done cooking and return to the empty pot. While the broccoli roasts and the pasta cooks, prepare the pesto. Combine all of the ingredients in a food processor or high-powered blender (I used my Vitamix). Pulse on low speed until the ingredients come together. Make sure to scrape down the sides if you’re using a food processor. If you’re using a blender, keep the motor on low and use a tamper/scrape down the sides to make sure your pesto doesn’t become too smooth and pureed. You want the ingredients broken up into little bits, but not completely smooth. Taste, and adjust salt, pepper, and lemon to taste. If you want it thinner, you can add more olive oil or switch to filtered water - I ended up adding about ¼ cup of water to get it to my desired consistency. 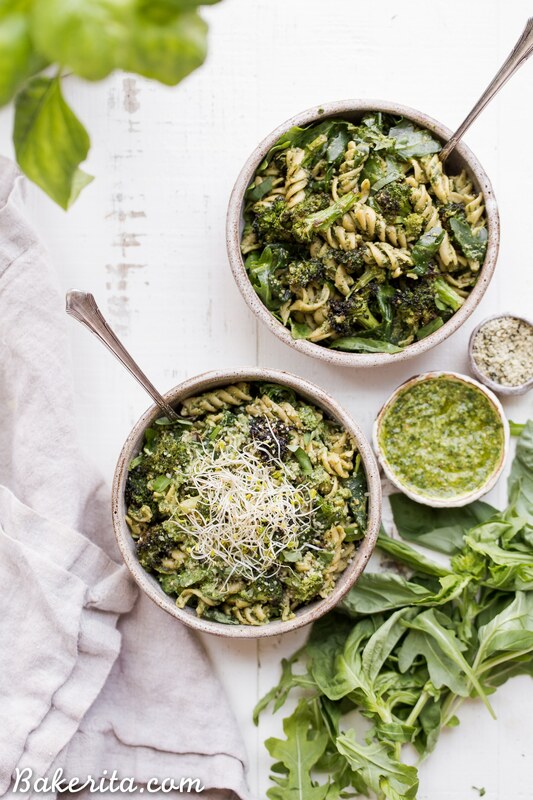 Once everything is finished, add the broccoli and pesto to the pasta, along with a big handful of fresh arugula. Stir together over very low heat to warm everything up and help wilt the arugula. Once the arugula is wilted, you’re ready to serve. Add to bowls and garnish with hemp seeds, sprouts, and vegan parmesan cheese. Enjoy! The nutritional info assumes you'll use all the pesto, but you might have a little leftover, like I did. You can save any leftovers in an airtight jar or container in the fridge! This looks so delicious and I totally recognize it from your stories! I love everything you’ve mentioned here and I’m a fellow Banza fan! Will be giving this a try very soon. Thanks so much for the love Joi!! I was wondering if there was another nut I could Sub in for pecans that wouldn’t affect the flavor too much? Hi Karina, pine nuts or almonds would be a great sub here! You could even use hemp seeds to keep it nut free.